"Puss in Boots", is a French literary fairy tale about a cat who uses trickery and deceit to gain power, wealth, and the hand of a princess in marriage for his penniless and low-born master. The tale was written at the close of the seventeenth century by Charles Perrault (1628–1703), a retired civil servant and member of the Académie française. 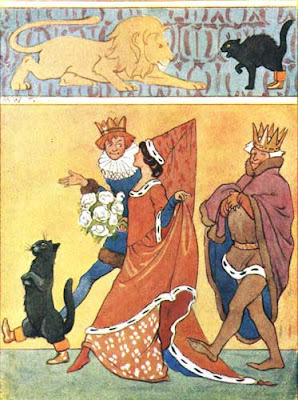 The tale appeared in a handwritten and illustrated manuscript two years before its 1697 publication by Barbin in a collection of eight fairy tales by Perrault called Histoires ou contes du temps passé. The book was an instant success and remains popular today. At one of my favorite art websites, there is an entertaining viewpoint on the Puss in Boots tale. Click here. A morality tale for our troubled economic times, perhaps? "If you will only get me a strong game bag and a pair of boots," said the cat, "I will show you some things that you do not know." "May it please your royal highness, I have brought you a rabbit which my master sends you as a token of his love." "Your master! Who is he?" 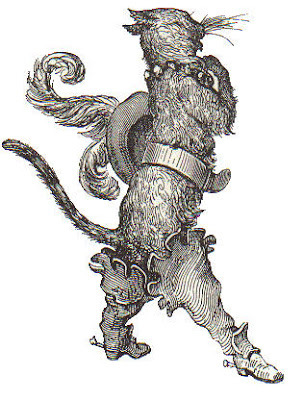 "The Marquis of Carabas, sir," said the cat, and he bowed very low. I love fairy tales. They speak to the deepest parts of us. I enjoy the Dore illustration most. Any time I see a Parrish I forget why I'm looking at it, and remember the painting in our house when I was very small. I used to stare at it - but I don't think I really liked it. It just fascinated me. Ah, the younger years, lol, thanks for the memory my friend. 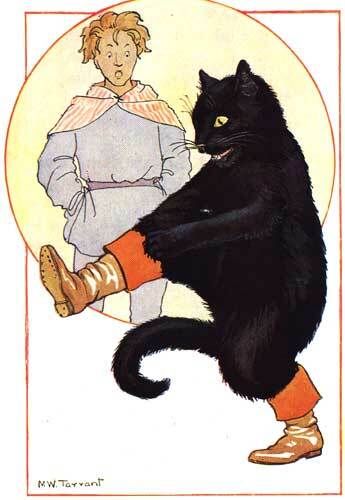 I always loved this story - the cheek and panache of the cat, and the boots, usually ilustrated as great soft leather affairs with large roll-down tops. Like boots in Rembrandt paintings. Wonderful new blog to read, too - Thanks!! 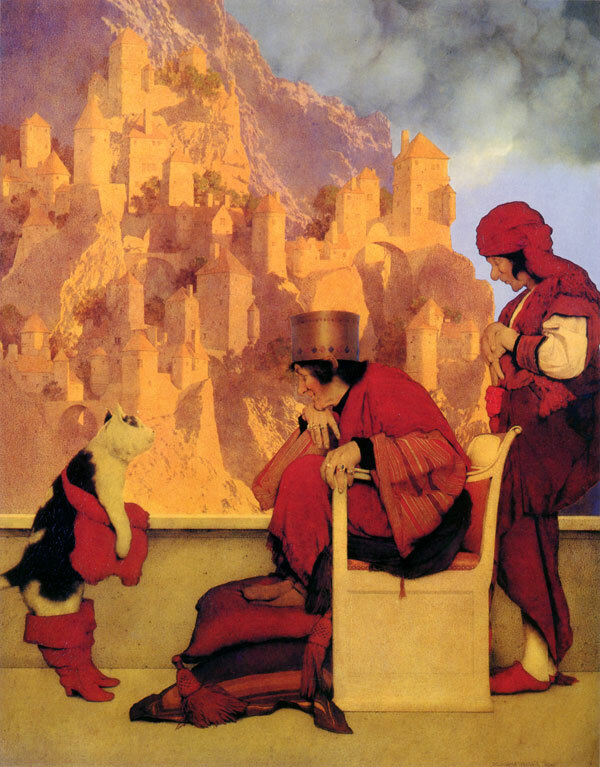 The 19th century illustrators were the ones who gave me the most inspiration to draw and paint. Dore is a marvel among them but most engendered images and concepts difficult to translate into modern graphic perceptions. 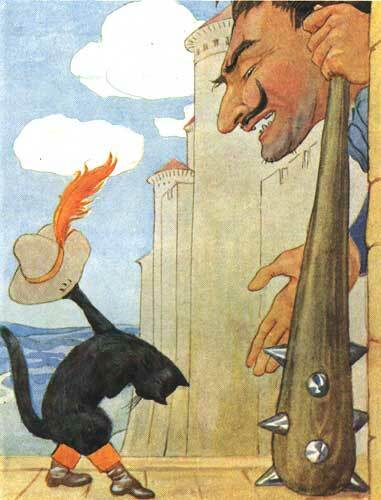 Puss In Boots remains a wonderful story whose message is more subtle now than then. wonderful illustrations. i've always loved fairy tales, too.